If you read my blog regularly, you’ll know that I’m a huge geek, and love all things STEM. (Science, Technology, Engineering and Mathematics). So when the the team at Learning Resources UK asked me to give away 2 Beaker Creatures Extra Reactor Pods, I was happy to say yes! 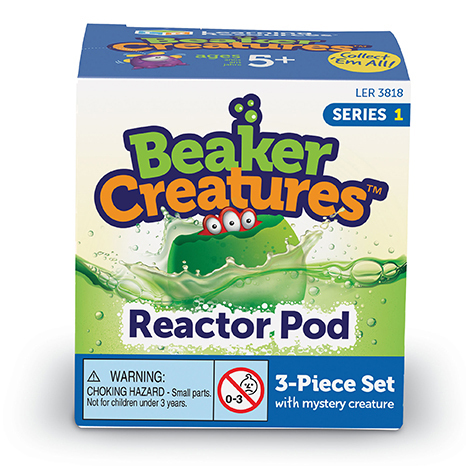 The Beaker Creatures Extra Reactor Pods are perfect alternative Easter gifts, as they only cost £4 each to buy! Beaker Creatures™ are suitable for children aged 5 and over. They are best suited for 5-9 year olds. 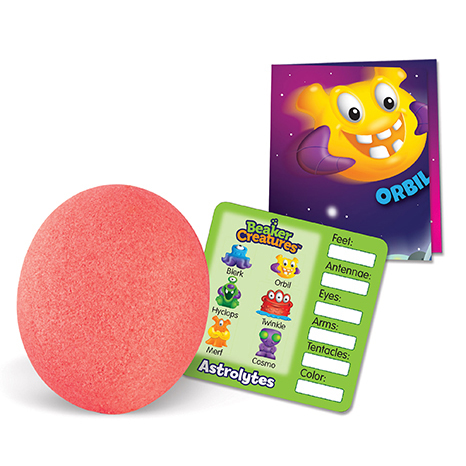 Kids get to combine the amazement of learning through science, with the anticipation of surprise collectibles. With 35 Creatures to collect, from five different planets, kids will love building an out-of-this-world collection! Additionally, there’s the excitement of wondering if you will be lucky and uncover one of the rare 24-carat Creatures! Each pod allows children to create amazing bubbling reactions. Firstly, you simply drop a Beaker Creature Reactor Pod into a bowl of water. Secondly, you watch it fizz and bubble, before revealing the collectible inside. The complete collection of 35 Beaker Creatures features Six Creatures from five planets: Astrolytes, Oceanites, Frostonians, Buglettes and Minisaurs. Additionally, there are Five limited edition 24-carat Creatures, too. Each pod features multilingual packaging and experiment guide. One Beaker Creature Reactor Pod and a Classification Card. Additionally, there’s a mini-poster, featuring amazing science facts and fun images. So, to be in with a chance of winning, all you need to do is fill in the gleam form below. Firstly, this giveaway is open to UK residents only. The winner will be drawn within 48 hours of the giveaway ending. They will be contacted via email. The winner most reply with their full name, address and contact number within 48 hours, to accept their prize. Failure to do so will forfeit their prize, and a new winner will be selected at random. Finally, please fill in the gleam form below. Last but not least, good luck! Additionally, why not check out more of my giveaways here. Ohh this looks like lots of fun! My children would be fighting over this! To my son! Thank you. My 6 year old twins. My nephews would have fun with this!! Who would you give the prize to, if you won? I would give it to one of the foster children as they would love it. My four year old daughter, Ella would love this!! I’d give mine to my 5 year old nephew! My Grandson would absolutely love this. Both of my kids would love to experiment with this together. I would give this prize to my 11 year old sister. She loves getting creative and imaginative and loves experimenting. my son Harry he would love it! It would be perfect for our middle child. Thank you. If I was fortunate enough to win I would love to give this to my little boy. He will enjoy playing with this. I’d give this to my niece. She’d love it! My lovely Nephew Joe, he would really enjoy it! I would give these to my nieces! They would live them! I would give it to my son it is definitely some he would enjoy. This would be perfect for my seven year old niece! Love to win this for my daughter. id give the prize to my son, he’s obsessed with bath bombs. He would love these! I’d give it to my son to go with his Beaker Creatures sets. He got a few different items from the range for Christmas and has played with them alost constantly since. He’s very proud and always tells everyone “They’re Learning Resources! !” in a very proud voice haha. I would give this to my nephew who would have a lot of fun with it. I’d give these to my son! He’s been eyeing them up! I would give it to my husband because he is a chocoholic!!! My young daughter would absolutely love this!! I’d give this to Daisy. At 8 years old she’s in the right age bracket for it and as she loves science I think she would really enjoy this. My 6 year old would love these! If I won I would give this prize to my Daughters. my little girl – she loves this sort of stuff! There would be stiff competition from my son and daughter for this! They would both love it! I would like to win for my nephew and niece. I’d definitely give to my boys! My son and daughter, they would love this! I would give this Beaker Creature Extra Reactor Pod to my Grandson, who absolutely loves Science; he would be more than fascinated. I would give this to my nephew Luke. This would be perfect for my nieces. I will give it to my friend for her daughter. Thank you!